A set of two Victorian trade cards originally published in the late 1880s. 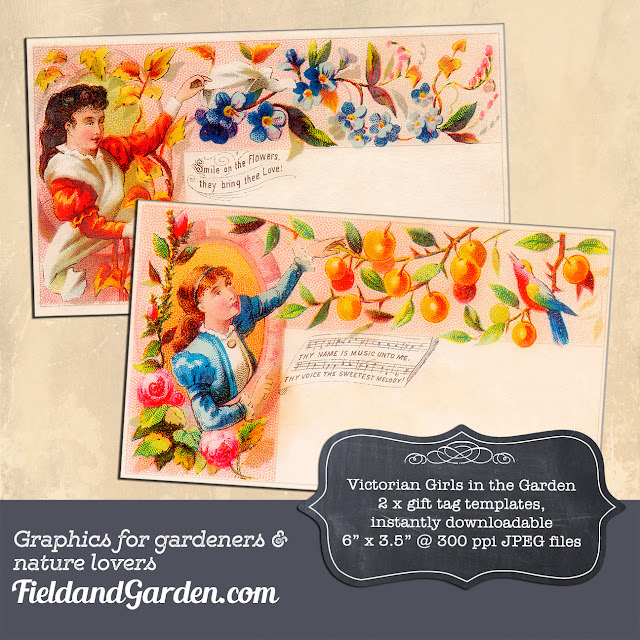 The first card shows a girl in a summer orchard, reaching up to pluck a ripe peach as a colourful bird sings joyfully on a bough. A little verse below her hand reads: "Thy name is music unto me, Thy voice the sweetest melody." 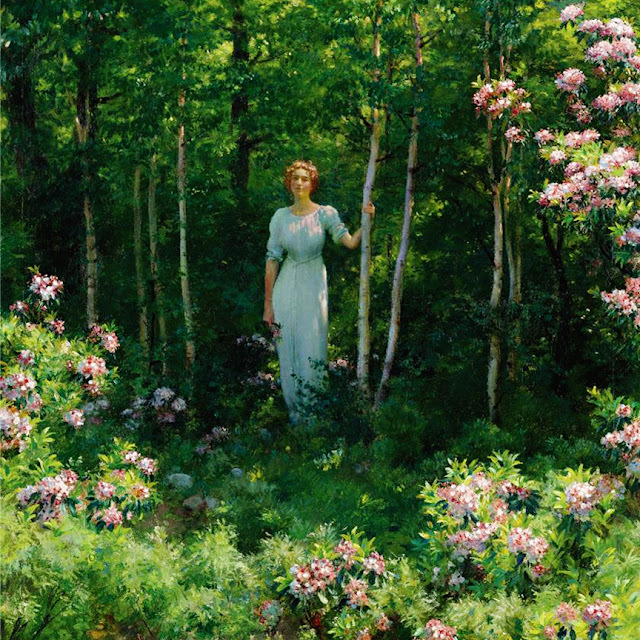 Her image is surrounded by a border of garden roses. 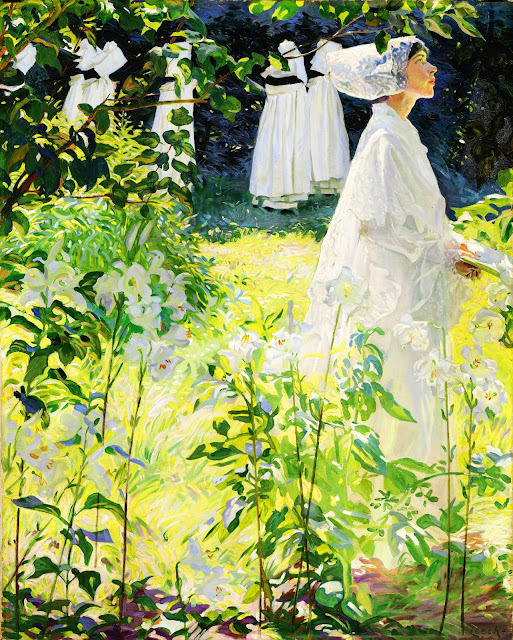 The second card shows another girl surrounded by various garden flowers, waving a handkerchief either in greeting or farewell. The verse that accompanies this card reads: "Smile on the flowers, they bring thee Love!" Both have white space where you can add your own personal message. 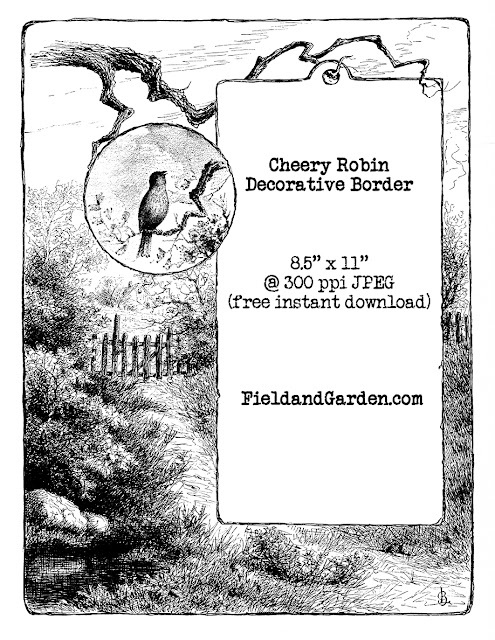 You can use these templates in garden and nature journals, for scrapbooking or in other graphic design projects such as for gift tags or greeting cards. You can download the high-res 6" x 3.5" @ 300 ppi JPEGs without a watermark here and here. An antique Victorian trade card from c1890 with three chicks - the two yellow ones are fighting over a stalk of wheat - and an over-arching border of more wheat, purple violets and one red rose. 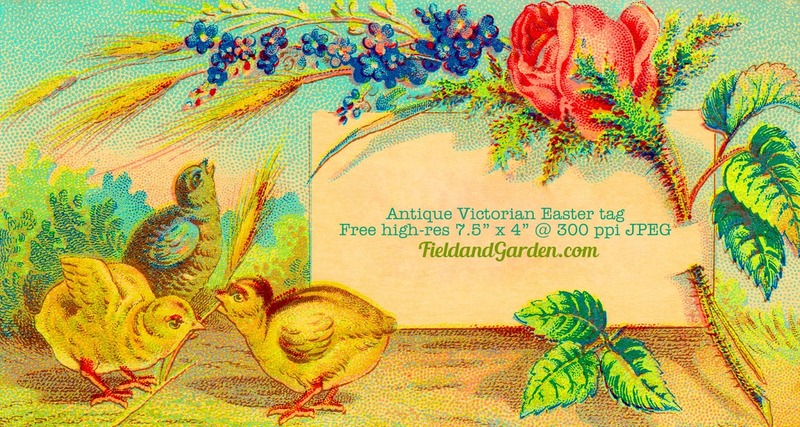 I thought this would make a fun hang tag or label for Easter baskets and loot bags or a place card for Easter lunch but you could also use it in a spring-themed project. High-res 7.5" x 4" @ 300 ppi JPEG is free to download here. 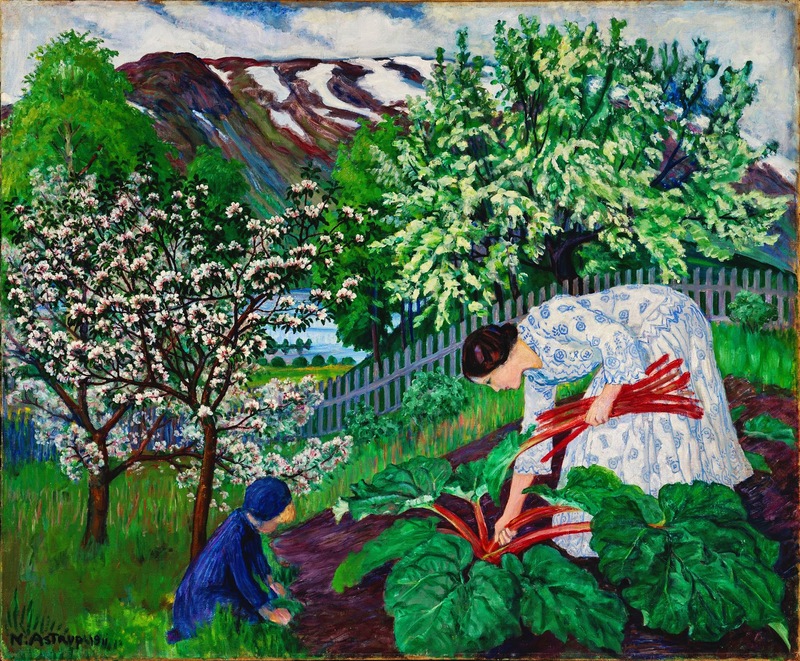 It often happens to children - and sometimes to gardeners - that they are given gifts of value of which they do not perceive until much later. Lovely antique border showing a cheerful robin perched on still-bare branches singing a song to welcome in the spring. You can certainly use this to decorate a journal or scrapbook page but it is also useful for spring-themed announcements such as for baby and wedding showers, yard sales and community get-togethers. You can download the high-res 8.5" x 11" @ 300 ppi JPEG without a watermark here. The forest was not dark, because darkness has nothing to do with the forest — the forest is made of life, of light — but the trees moved with wind and subtle creatures. In this picture, Leech’s first wife Elizabeth poses as a novice of the Soeurs du Saint-Esprit, looking up contemplatively from her prayer book, as nuns from the same order, their heads bowed in prayer, process through the shadows in the background. The setting is the walled garden of the nuns’ hospital and convent in Concarneau, in which Leech had convalesced in 1904, having contracted typhoid fever. Elizabeth wears the Breton bridal costume traditionally donned by novices on the day they took their final vows. 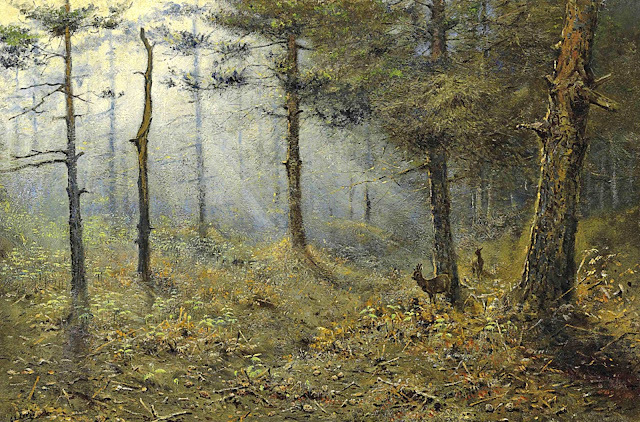 The painting reflects ... the artist’s particular love of sunlight and pattern. Leech shows admirable confidence in painting with vigour and freedom on such a large scale, and in managing a complex palette of, among other colours, acid greens, bright yellows, subtle pinks and various shades of white. He displays particular skill in suggesting Elizabeth’s slim, elegant form under the delicate folds of her dress. 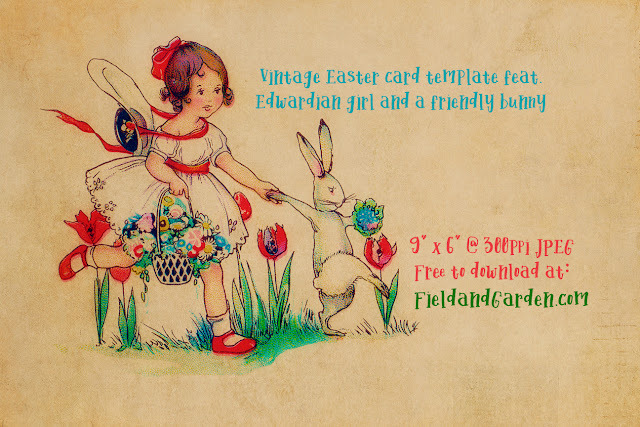 A vintage Easter greeting card from 1903 featuring a cute illustration of an Edwardian girl carrying a basket of flowers in one hand while she is led hurriedly along by a skipping bunny (clutching a posy of flowers in one paw). Are they headed to a big Easter egg hunt or a festive spring celebration? I've removed the original words so you can add your own in Photoshop or Microsoft Word. To download the free high-res 6" x 4" @ 300 ppi JPEG for your Easter or scrapbooking projects, please click here.